Full sun to mostly sunny. [24" tall x 20" wide]. USDA Hardiness Zones 4-10. 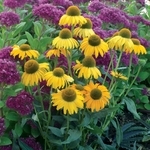 Echinacea 'Dixie Sun' PPAF. Colorful golden yellow flowers are supported by strong stems and exceptional foliage. Terra Nova says the flowers are... "Sweet as Tupelo honey..." A super choice for southern gardeners and anyone else looking for deer-resistant plants. The Dixie™ series from Terra Nova features compact plants with superior garden performance. You can expect lots of intensely colored flowers on well-performing plants. Due to their size and explosion of flowers these varieties make good container plants. The fragrant flowers attract butterflies and make excellent cut flower bouquets.